ANUG or Acute Necrotizing Ulcerative Gingivitis is an inflammatory destructive disease of the gingiva which shows punched out, crate like depressions at the crest of the gingiva, covered by gray pseudo membranous slough which is demarcated from the remaining gingiva with a linear erythema. It is also called as Trench Mouth as ANUG was seen mostly in soldiers who went for long duration without proper oral hygiene added to the psychological stress they were facing. 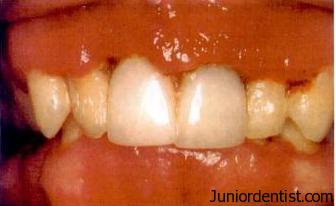 These punched out lesions are most commonly seen in relation to the lower incisors and also seen in upper incisors. ANUG comes under periodontal disease which is associated with severe pain in the Gingiva and extreme foul smell from the oral cavity. The most common causes for ANUG are poor oral hygiene, psychological stress, malnutrition, smoking, immunosuppression etc. When patients are affected with ANUG bad breath or Halitosis is commonly seen along with bad metallic taste. It is also called as the Staging of Acute Necrotizing Ulcerative Gingivitis Lesions based on their extent. The treatment of ANUG is usually simple with proper debridement along with antibiotics most commonly Metronidazole in the acute phase and improving oral hygiene and healing is pretty fast without leading to much harm to the hard tissue. When the disease spreads to the bone the disease progresses to be called NUP or Necrotizing Ulcerative Periodontitis.